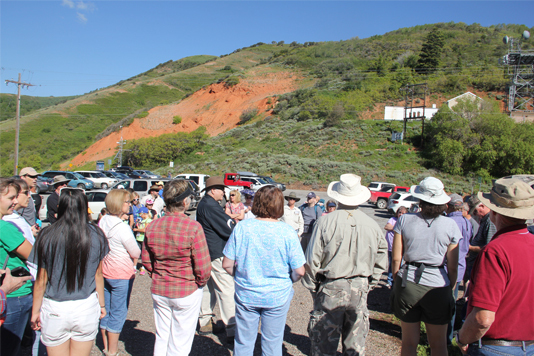 Friday morning provided descendants with another Egan experience – a three hour hike on the Mormon Trail – the authentic Pioneer Trail that Howard Egan traveled at least seven times. 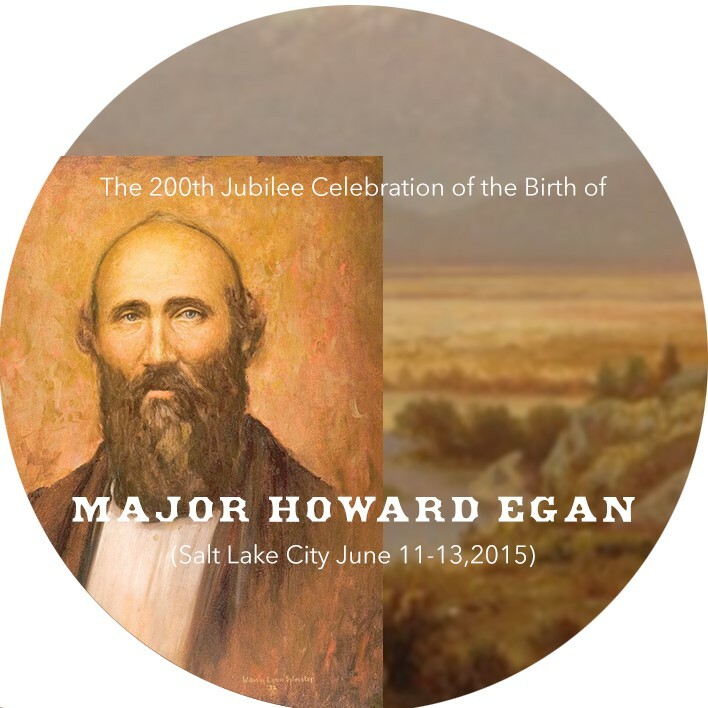 Howard’s first crossing was with Brigham Young’s 1847 vanguard Company. This trek, from Iowa’s Winters Quarters to the Salt Lake Valley, is to Utah and the Latter-day Saints, what the Mayflower voyage is to New England and American history. At Fort Bridger the pioneers turned from the Oregon Trail, to follow crude remnants of a trail blazed the year before by the Donner Party. 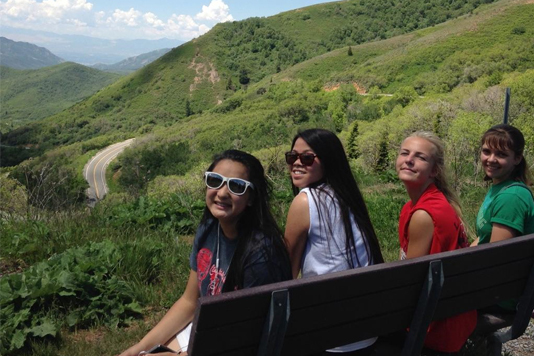 It led them into the Great Salt Lake Valley. The final thirty-five miles, down the eastern side of Big Mountain, over Little Mountain, and down Emigration Canyon, were by far the most difficult of the journey. The wagons descended 4,000 feet in two days, and many had to chain their wheels to slow their wagons. 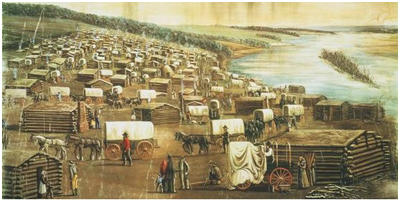 Finally, on July 24, 1847, the first group of Mormons arrived at their new home in the Great Salt Lake Valley. Not only did Howard help this venture succeed, but his diary is one of the best accounts anyone kept during this epic trek. 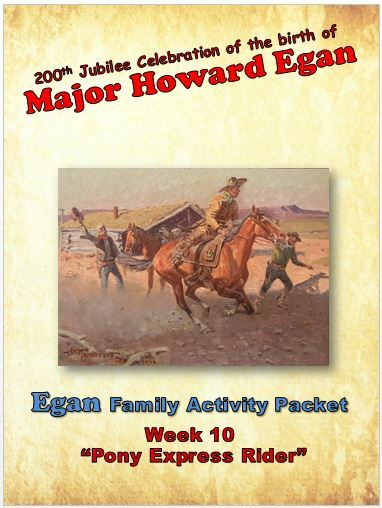 Almost every published history of the 1847 Pioneers draws from Howard’s diary entries. 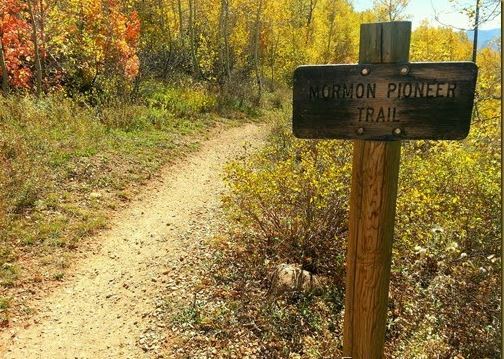 From 1846 to 1869, until the completion of the transcontinental railroad, nearly 70,000 Mormons would make their journey along this Mormon Trail. In 1847 Brigham Young’s Pioneer Company, including Howard Egan, following a route blazed first by the Donner Party a year before, traveled southward along Little Emigration Creek to Mormon Flats. There they had to leave the creek and head west and north and up to cross one of their biggest challenges, Big Mountain. They moved up a canyon for nearly five miles, up and up, and reached a crest near the summit. From there they viewed part of the Great Salt Lake Valley far away and below them to the west. They then descended down Big Mountain to Little Mountain, went up and over it, and entered the Great Salt Lake Valley through Emigration Canyon. 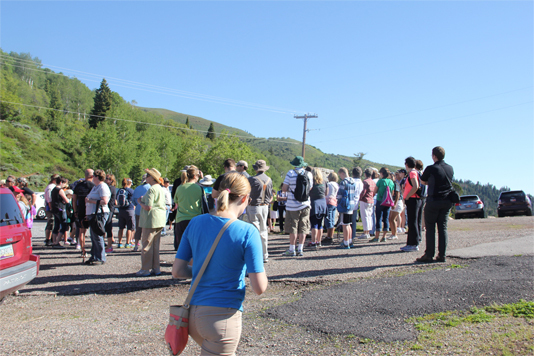 by Congress as the Mormon Pioneer National Historic Trail. 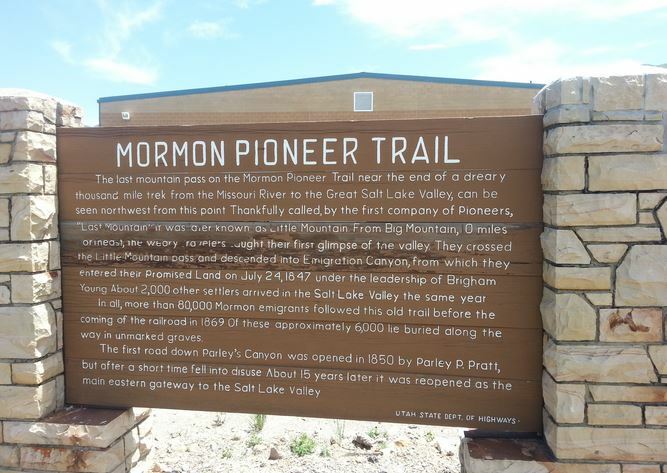 That trail extends for 1,300 miles from Nauvoo, Illinois to downtown Salt Lake City. 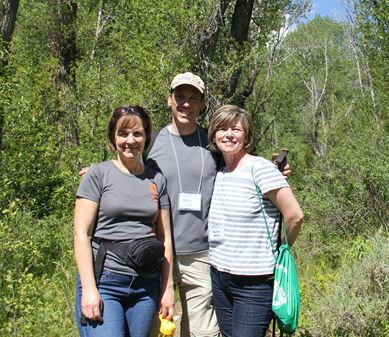 Some 60,000-plus Mormon emigrants used some or all of that trail to “gather to Zion” between 1846 and 1868. For years the main route in Great Salt Lake Valley was this one, but by the 1860s an alternate became popular that used Parley’s Canyon (the “golden pass” road). Almost all wagons were pulled by oxen. Until 1861, this trail segment was also the route of California gold seekers, Overland Stage, Pony Express, original telegraph line, and other Mormon emigrant companies, after which Parley’s Canyon became widely used. The 4.5 mile hike between the Big Mountain crest and Mormon Flats can be made from either end, going downhill or going uphill, as happened during the Pioneer era. 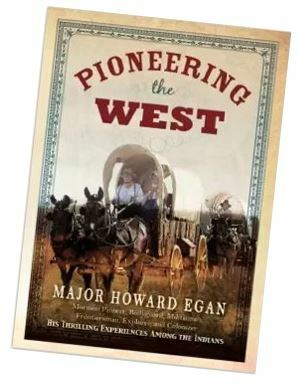 Howard Egan traveled in person on this stretch, seven times: (1) westbound with the1847 pioneers, (2) eastbound with the returning 1847 pioneers, (3) westbound in 1848 with Tamson and the boys, (4) eastbound in late 1848, (5) westbound in 1849 with wife Nancy and leading a freight wagon company, (6) eastbound in 1858 taking Thomas L. Kane to Pennsylvania, probably driving a carriage pulled by mules, and (7) westbound in 1848, returning home. October 1, 1847, just before entering Great Salt Lake City: “Sister P.M and Edith walk[ed]–very, very dirty, Thro brush & timber–up the Mt. to Bellows peak where we met J. T. who ask’d me if I had lately seen my face, his own being behind a black mask”. . .
“October 22. Morning fair and frosty. Crossed Bear River. Deep and rapid. Traveled to Kanyon [Canyon] Creek. October 23. Day fair, road bad, many steep places crossing creek. Had to ascend the Bluffs which are very steep, the be[a]ver dams being impassable in the road. Camped in ravine two miles east of the summit of the Big Mountain, making twelve miles today. October 24. The descent of the Big Mountain being very steep, had to rough lock wagons. Traveled to west fork of Little Mountain. 1856: Survivor Barnard White: (The Whites’ wagon train was with the Martin and Willie handcart co’s). 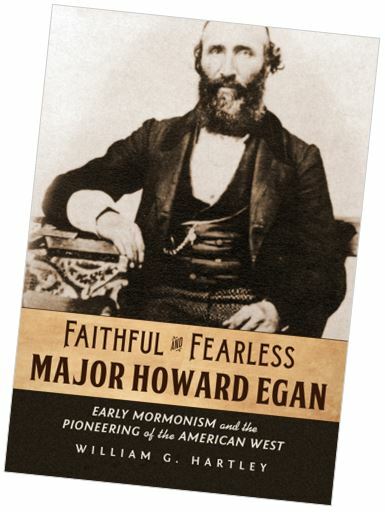 Major Egan’s fine 1847 journal describes his travels from Mormon Flats and up Big Mountain and into the Great Salt Lake Valley with Brigham Young’s tail-end company. Most pioneers arrived in the Valley a day or two earlier, but Young’s company traveled slower due to his being ill. The morning was cloudy. President Young is some better, and Father Sherwood is doing well. About 7:30 we again proceeded on our journey, about a south course, and traveled about two miles when Father Case rode up and reported that one of his wagon wheels had broken down. About a mile further we stopped. I went back in company with Brothers Kimball and Benson to help Father Case up. Brother Kimball cut a pole and we lashed it under the axletree, and put Brother Benson’s horse ahead of the others and hauled him up. We had a light shower this forenoon. The brethren took out most of Father Case’s load and we proceeded on our journey, having crossed Ogden’s fork [Emigration Creek] four times this forenoon. The road is stoney and rough. 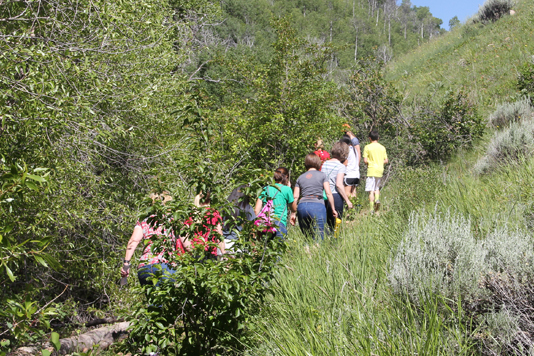 This afternoon we crossed the stream seven times, the road winding through a long narrow ravine, and over hills, and through dense thickets of willows and cottonwood groves. We came about eight miles and crossed a very bad slough. One of Brother Young’s horses mired down. He had to unhitch him to get him out. 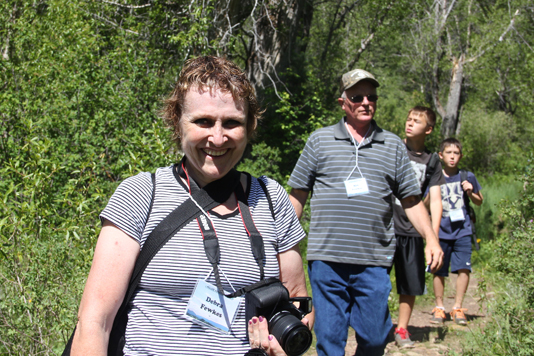 We then descended a steep hill and encamped on the banks of Ogden’s fork [Emigration Creek] about a quarter of a mile beyond where we found the letter, having traveled seven and one-half miles. The sick are getting better this evening. The morning was warm and pleasant, and we proceeded on our journey about 6:45, the road leaving the stream here and turning short to the west, and passing up a ravine, about a west course over a gradual ascent. [They now start the 4.5 mile route up Big Mountain] The road is rough, rocky, and sideling in many places, and leads through dense thickets of underbrush, and quite a forest of hemlock and poplar trees. At length, after traveling about four miles, we attained the summit of the hill. [At the crest of Big Mountain] Here we had a fine view of the snowy mountains and the open country in the distance. We have passed two or three springs during our travel this forenoon. We have begun to descend a long steep hill, part of the way we had to chain both wheels. The descent is winding over a rough road, there being many stumps to annoy us. About half way down Brother L. Young’s ox wagon turned over. His two little boys were in the wagon at the time, but providentially escaped uninjured, though part of the load, having been disarranged, rolled upon them, stopping up the entrance, but they were liberated by cutting a hole in the wagon cover. As we descended, the road bearing to the south, we crossed a small stream six times, which ran along the base of the hill through a ravine, and after having come six and one-half miles down a gradual descent we encamped on an open area of ground, spoken of by Orson Pratt, as being an arm of prairie, putting up among the mountains from the western outlet, about 12 o’clock, having come this forenoon about eight and one-half miles. While we were stopped here, J. Pack and Joseph Mathews rode up on horseback. They reported both companies of the brethren to be about fourteen miles ahead, encamped in a valley about twenty-five miles from Salt Lake, which could be seen in the distance to the northwest. When they left this morning the brethren were preparing to move four miles farther, and then stop and commence planting. They say the soil is very rich and fertile. They also brought a letter from O. Pratt, G. A. Smith and W. Richards to President Young, giving an account of the road and the general features of the country, etc. After a halt of about two hours we again proceeded on our journey, going south of west a short distance, the valley becoming more confined in its limits as we advanced, until we began to ascend a long steep hill, which is about one and one-half miles to the top. Here Brothers Pack and Mathews left us and went ahead. We began to descend a long steep hill [Little Mountain], bearing a southwest course. The most of the way we had to chain both wheels. As we descended the above hill we saw an abundance of service berries. At 5 p. m. we encamped at the base of the hill, on the banks of a small clear stream of cool water [Emigration Canyon creek]. Its banks are thickly skirted with quaking asp and cottonwood trees. We have come this afternoon three miles, and during the day eleven and one-half miles. A short time after our arrival at this place, the sky became overcast with clouds, and a strong wind, setting in from the southwest, gives the appearance of a very heavy storm. The grass here is rather tall and rank, though in places is pretty good. The sick are gaining strength as fast as could be expected, considering the fatigue of the journey. The day has been the hottest we have experienced since we left Winter Quarters. There was not a breath of air in the ravine, and the dust was almost suffocating. The morning was pleasant. In getting up our horses we discovered that some were missing, two of Brother Whitney’s and two of Brother Smoot’s. The camp started, leaving Brothers Whitney’s and Smoot’s wagons behind. I rode ahead about a mile and could not find them, nor see any tracks. I then returned and went back about three miles and found them. After I got to the wagons, Brother Whitney and I got on our horses and rode ahead. The road was rough and uneven, winding along a narrow ravine, crossing the small stream, which we last encamped on, about fifteen or twenty times. We then left the ravine and turned to the right and ascended a very steep pitch, where we beheld the great valley of the Salt Lake spreading out before us [Probably near where the Pioneer Monument is in This is the Place State Park]. My heart felt truly glad, and I rejoiced at having the privilege of beholding this extensive and beautiful valley, that may yet become a home for the Saints. From this point we could see the blue waters of the Salt Lake. By ascending one of the ridges at the mouth of this canyon, the view over the valley is at once pleasing and interesting. These high mountains on the east side, extending to the head of the valley, about fifty miles to the south, many of them white on the tops and crevices with snow. At the south end is another mountain, which bounds the valley in that direction, and at its western extremity it is joined by another range, forming its western boundary to the valley and extending in a northerly direction until it ceases abruptly nearly west of this place. The valley between these mountains is judged to be twenty-five to thirty miles wide at the north end of the last mentioned mountain. The level valley extends to the Salt Lake, which is plainly visible for many miles in a western direction from this place. In the lake, and many miles beyond this valley, are two mountains projecting high in the air, forming a solemn but pleasing contrast with the dark blue waters of the lake. Beyond these two mountains and in the distance, in a direction between them, is another high dark mountain, supposed to be on the western boundary of the lake, and judged to be eighty to one hundred miles from here. At this distance we can see, apparently, but a small surface of the water, extending between this valley and the mountains referred to, but that surface is probably thirty miles wide. Looking to the northwest, another mountain appears, extending to the north till hidden by the eastern range. At the base of this mountain is a long ridge of white substance, which from its bright shining appearance is doubtless salt, and was probably caused by the dashing of the waves, and then hardened by the sun. The whole surface of the valley appears, from here, to be level and beautiful. The distance from here to the lake is judged to be forty to fifty miles. Throughout the whole extent of the valley can be seen very many green patches of rich looking grass, which no doubt lays on the banks of creeks and streams. There is some little timber also on the streams and in the direction of the great lake many small lakes appear upon the surface, the waters of which are doubtless salty. From a careful view of the appearance of the valley from this place, it cannot be concluded to be otherwise than rich and very fertile. After leaving the canyon about two miles we came in sight of the other camps, a few miles to the west. Proceeding on we found the road descending gradually but very rapidly. At 11:45 we arrived at the camp of the brethren, having traveled nine and one-fourth miles today, making the total distance from the guide board at Pratt’s Pass to this place 41¼ miles, and from Fort Bridger 115½ miles, and from Fort John (Laramie), 512½ miles.